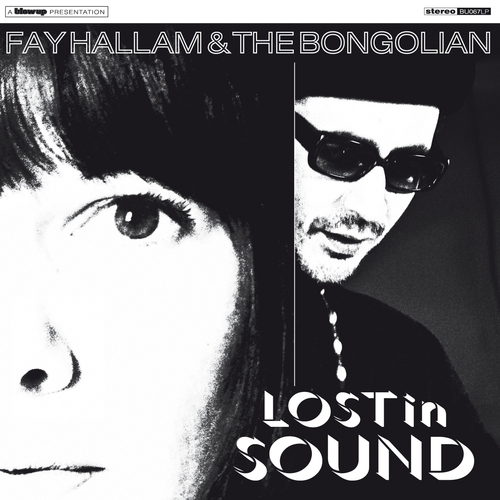 When Fay Hallam (Makin' Time, The Prime Movers, Phaze) played live at Blow Up and was introduced to Blow Up's very own recording artist, Mr Nasser Bouzida AKA 'The Bongolian', little did they know that they would shortly get together to create the album 'Lost in Sound'. Both Fay and Nasser share a serious passion for 60's Hammond Beat and Soul. In the studio, they felt free to experiment with different sounds and rhythms, immersing themselves in the sounds they both love, including Bossa Nova, heavier 70's grooves and a strong Northern Soul influence. During the months they worked on the recordings, Fay would bring the basic songs into the studio, and along with Nasser, flesh out the arrangements. Their choice of instruments included mainly old Rhodes, Wurlitzer and Hammond C3 keyboards and other vintage equipment, mixing things up with some cool cinematic synth. sounds. As the sessions developed, the songs kept flowing; finally resulting in the album being completed in London where it was mixed by Miles Clarke (The Who / Pete Townsend engineer), with additional mixing and mastering by Nick Bennett. Fay Hallam, originally from Wolverhampton, a long time exponent of 60’s style beat and pop, has performed over the years in acts such as Makin' Time (which also included a pre-The Charlatans Martin Blunt) to The Prime Movers, Phaze and The Fay Hallam Trinity. Over the years she has worked with Billy Childish, Graham Day, Alan Crockford and other luminaries of the Medway scene where she lived for 17 years. She has toured the UK and Europe extensively over the years, in one guise or another and is a respected musician around the world. A prolific songwriter, she has made over 9 albums.